The Marblehead Seasiders enjoyed a successful first season in the North Shore Baseball League. The town’s return to the NSBL was the highlight of Marblehead baseball’s summer season. The Seasiders played hard and with pride while competing in the NSBL. It had been twenty-two summers since Marblehead last fielded a team in the league. The Marblehead Yachtsmen, who played in the league from 1977 through 1994, and the Marblehead White Caps, who played from 1993 through 1995, were the last teams to represent the town in the highly competitive amateur league. The Seasiders were formed when local businessman Joe McKane, who served as general manager, and former Marblehead High School star Connor Green, who designed the team uniforms and hats, and recruited many players, decided to enter a team in the NSBL. Shortstop Green and first baseman Will Vigneron (.352 BA, HR) served as team captains. Right fielder Trey Blackmer (.333 BA, team-leading 10 runs scored) represented the Seasiders in the NSBL/Worcester County all-star game. Blackmer was nominated for Rookie of the year honors along with pitcher Joe Maguire and utility man Nick Latham (.382 BA, team-leading 12 RBI). Maguire ended up being one of four finalists for the award. The UMass Boston product, who recorded 13 strike outs in a complete game four-it-8-0 win over the Storm, finished the season with a 3.09 ERA and placed second in the NSBL with 43 punch outs in 43 innings of work. He also had a team-leading 10 appearances. Catcher Matt Bouchard was cited as the team’s most improved player. 2016 MHS graduates Josh Tassinari at designated hitter and Tedd York (1-0 W/L Record) at pitcher and utility infielder, contributed spirited play for the Seasiders. Brothers Jason and Brent Tarasuik saw their seasons cut short by injury. Brent, who suffered a job-related knee injury, did manage to post a victory in his only mound appearance when he went the distance tossing only 63 pitches in a 2-1 win over Malden, the Seasider’s first ever victory. Jason was limited to just one at bat because of a ruptured muscle in his right forearm. Former Yachtsmen player, coach and manager Tommy Roundy was chosen as the Seasider’s field manager. “Tommy was selected field manage because of his strong connection to the game of baseball and his past association with the Yachtsmen,” said McKane, who was a former Marblehead High pitcher and played summer ball for the Headers back in the ‘50’s. McKane also served as fundraiser for the Seasiders. Roundy, who has been an assistant varsity coach on head coach Jason Tarasuik’s staff at Marblehead High School since 2011 and was an assistant coach under head coach Ken Perrone at Salem State from 1985 through 1990, came up with the name Seasiders. “I always thought if a team was formed again to represent the town in the North Shore League the name Seasiders was a no brainer,” said Roundy, whose father, the late Elliot Roundy, served as the Yachtsmen general manager and fundraiser. Roundy’s other son Sam was the driving force behind the formation of the Yachtsmen when he was playing at Salem State. Dave Rodgers, who managed and played for the Yachtsmen for a number of year and served as chairman of the town’s park and recreation commission, lobbied in 1990 for the Seaside Park grandstand to be named after Elliot who spearheaded a fundraising effort to save the grandstand from being demolished. After the fundraising effort was completed, the grandstand received a total facelift by students from North Shore Vocational School, who did the work as a class project. The school project was directed by teacher Arthur Bernard and the architectural study was done free of charge by Marblehead residents Daniel Lynch and William Yuhas. The grandstand, built in 1916, celebrated its 100th birthday this summer with the formation of the Seasiders being the highlight of the celebration. The Seasiders’ inaugural season was highlighted with victories over playoff qualifiers Champions Pub, the North Shore Storm and the Newburyport Nor’easters. The Seasiders also posted exciting one-run decisions over the Malden Giants. 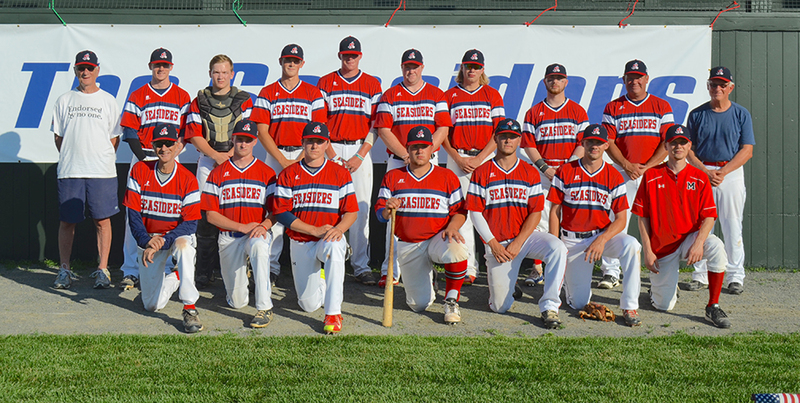 The Seasiders closed on their inaugural season, winning three of their last four, including a 10-0 win over Malden in the season finale at Seaside. Contributing to the successful season were Vincent Toomey and Frank Martin. Toomey served as the team’s scorekeeper/statistician and Martin performed a variety of tasks including field maintenance. Bob Green provided valuable advice while Debbi Green served as team photographer. Other Members of this year’s club included Justin Beechwood, Danny Colbert, Mike Cornell, Evan Gagnon, Ross Gienieczko, Matt Haley (2-1 W/L record) Max Hall, Peyton Janscy (.414 BA), Ryan Kelleher, Adam Maggiacomo, John Oliveria, Mike Raymond (.400 BA, HR), Jeff Stern, Sammy Stern, Liam Tubirdy (.289 BA) and Matt Wesoloski (team-leading 3.06 ERA).